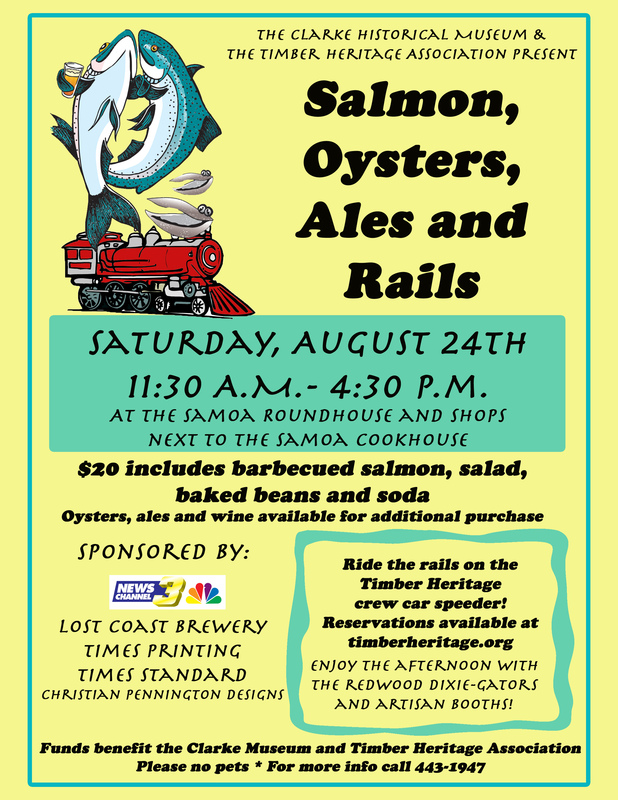 All aboard for salmon, oysters, ales and rails! On Saturday, August 24th from 11:30 a.m. - 4:30 p.m., the Clarke Historical Museum and the Timber Heritage Association are holding our annual barbecue at the roundhouse in Samoa. Salmon plates are $20 a ticket and include barbecued salmon, salad, baked beans, fry bread, and a soda. Local beer, wine, oysters, and fry bread will be sold a la carte. The Redwood Dixie Gators’ music will be rockin’ the event, and there will be a variety of vendors. Last year was our biggest year yet, with well over 500 people visiting the Hammond Lumber site. At the event you can walk through the 1914/1916 passenger cars, view eight historical local locomotives, a caboose, and other historic logging equipment and tour the 1893 era industrial building. At this special event, take the opportunity to ride THA’s historic crew speeder cars on one of the area’s first railroads. 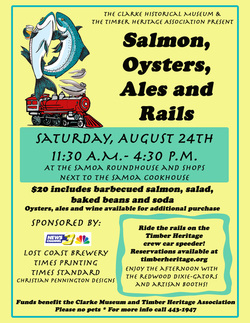 Reservations can be made at www.timberheritage.org - just click on the photo of the speeder car. This fund raiser supports both organizations’ mission of preserving local history. If you came last year you know it was a blast. Tell your friends, bring your family, and come out for a great time! If you are interested in being a vendor, a sponsor, or have questions about the event please call Carly or Amber at 443-1947.